Some days this looks like something that should be thrown on the fire and used to warm things up. Other days it looks like the base, the pedestal, for a new table. Try to lift it and discover it is incredibly heavy. A dense wood, this is a section of locust from our stand of trees. It is locust, a wood that is used for fence posts, is incredibly hard and stands up to decades of in ground abuse that causes most wood to disintegrate. It is naturally rot resistant. 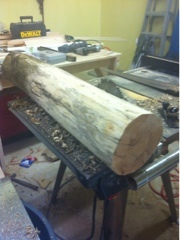 In this circumstance it is used for a table pedestal that will be used inside not outside, but it could be. No need for plastic or pressure treatments: a locally grown and harvested wood will do your job. The tabletop is next on the list of things that need built.